The Percussive Arts Society (PAS) today announced the addition of an educational clinic by the Phantom Regiment percussion section that will take place as part of the Percussive Arts Society International Convention (PASIC) this November in Austin, Texas. Phantom Regiment's percussion section, winners of the Fred Sanford Best Percussion Performance Award at the 2008 Drum Corps International World Championships, is led by Paul Rennick who is a member of the PAS Marching Percussion Committee. The clinic session is scheduled for Saturday, Nov. 8 at the Austin Convention Center. PASIC is the world's largest drum and percussion gathering that features leading percussion artists from around the world in more than 130 events on 13 stages. Session topics focus on a variety of percussive areas including drum set, symphonic, marching, recreational, world and keyboard. 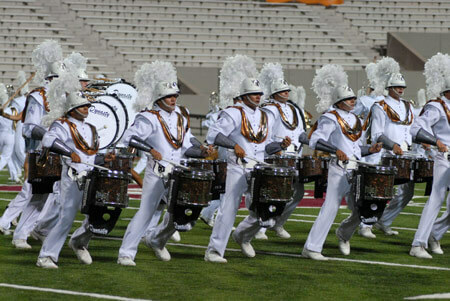 More than 7,000 drummers and percussionists are expected to attend the four-day series of events at the Austin Convention Center and Hilton Hotel from November 5 – 8, 2008. PASIC attendees will be treated to a number of educational clinics and performances by some of the leading names in the marching world. The following marching percussion artists are scheduled to present at PASIC: Nick Angelis, Dominick Cuccia and the Not-So-Traditional Players, Colin McNutt with Murray Gusseck featuring the University of Massachusetts and Santa Clara Vanguard tenor drum sections, and the United States Military Academy Band West Point "Hellcats" with guest Marty Hurley. Additionally, the PAS Marching Percussion Committee is hosting a panel discussion titled "Virtual Masters Part II: The Front Ensemble." High school and college students have the opportunity to compete as individuals or ensembles in the PAS Marching Percussion Festival that runs in conjunction with PASIC. This annual competition will take place on November 6 and 7 at the Austin Convention Center. The festival features a competition of high school and collegiate drum lines and solo performers vying for top honors in this nationally recognized festival.